AITech USB to HDMI Converter. with Audio Scan converter. Audio Video USB to HDMI adapter. 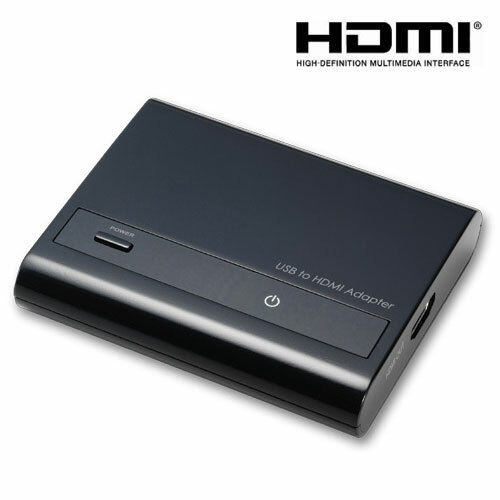 This USB to HDMI Converter enables you to connect one more monitor, LCD or projector to a computer with a USB 2.0 port. For desktop users adding an extra monitor via USB connection is easier than ever without having to open the computer chassis to install an internal video card. Once the installation is done, the USB-attached monitor soon wakes up. No function key hassle to swap a second monitor. With this handy adapter, you can enjoy many benefits brought by an add-on monitor. The most obvious one is that you get more desktop area to have more applications visible at one time. For example, you may work on one monitor while your family watching video on the other. No more stacking windows within the confines of a single display. Or you may span an application, e.g. spreadsheets, across two sides of displays. WindowsÂ® XP Home or Professional (Including Table edition) SP2 or SP3, Windows VistaÂ® SP1 or SP2 (32-bit or 64-bit) and WindowsÂ® 7 (32-bit or 64-bit). For 1-2 monitors, business usage, productivity target. This may not provide full frame rate DVD playback at full screen. For 3 monitors, where 1 could run DVD video while also targeting productivity and business apps. Operation System Support WindowsÂ® XP Home or Professional (Including Table edition) SP2 or SP3, Windows VistaÂ® SP1 or SP2 (32-bit or 64-bit) and WindowsÂ® 7 (32-bit or 64-bit). *Note that interlaced modes and reduced blanking modes are not supported. • I am so impressed with AITech’s wireless solution. The product installation is absolutely easy as advertised. The reception is also very good, consistent and clear as advertised. Thanks AITech! • Beautiful picture and sound. The remote is easy to set up and functions perfectly. Your wireless solution is exactly what I was looking for! • Within 10 minutes out of the box, I got great remote reception and control of my DirecTV receiver. Highly recommend AITech’s wireless system.